To stay relevant and competitive in business today, companies must respond and interact with their customers in ways that were simply inconceivable a decade ago. Mobile, social and cloud are enabling businesses to better engage with customers, but these technologies put new pressures on businesses, as many companies still find it challenging to move high-quality applications into the market at a rapid, market-driven pace. 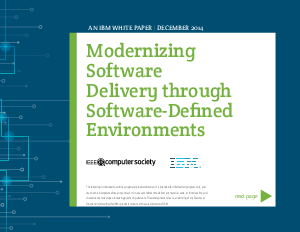 Software-defined-environments (SDEs) provide an essential, efficient, and comprehensive capability to extend the value of DevOps to all layers in a platform, enabling companies to design, deploy, and update full stack environments providing a streamlined approach to innovation while lowering costs and risks.